Students will practice art interpretation by examining Walter Ellison’s Train Station, 1935. In doing so they will connect close examination and interpretation of art with the practice of close reading. Students will explore the role of metaphor in the painting by watching a video on the Art Institute of Chicago website in which art historian Dr. Karen Buick discusses the painting. They will discuss of the issues represented in the painting and their understanding of the meaning Ellison intended. A written text about the painting will also be examined so students can compare and contrast various ways of representing and describing a common subject. Finally, students will write their own narratives to reflect their understanding of the Great Migration. There is no specific background needed for this introductory lesson. What hopes and expectations do migrants and immigrants carry with them upon arrival in a new place? How does an artist communicate a story? How can art and primary source documents help us better understand the experiences of migrants and immigrants? Artists make choices using line, color, form, shape, texture and pattern to tell stories, share ideas, and convey emotion. Through the process of carefully looking at and thinking about art, we can interpret these visual clues to understand an artist’s intent. However, critical visual literacy does not rely on observations alone. Research into the context in which a work of art was created and the artists’ biography deepens our understanding of that artwork. Students will analyze various accounts of a subject told in different mediums, determining which details are emphasized in each account. Students will draw evidence from informational texts to support analysis, reflection, and research. Students will initiate and participate effectively in collaborative discussions about the Great Migration, building on others’ ideas and expressing their own clearly and persuasively. Introduce and discuss Train Station: Display the painting for students and give them a few minutes to examine it. Then guide a discussion with questions such as the ones below, which are designed to help students attend to details within the painting that reveal Ellison’s intended meaning. Depending on students’ background knowledge, you may not need to provide each of these prompts; they might emerge organically from the students’ reactions to the painting. What is happening in this painting? How do you know? What kind of place is this? What’s the location? What clues make you say that? In what time period might this scene take place? What do you see that makes you think that? What do you notice about the people in the painting? What groups of people can you identify? Explain your response. How has the artist reinforced the differences between the groups of people? Consider details like dress, activity, the architecture of the train station, etc. Where are the people going? What do you see that makes you say that? What colors do you see in this painting? How do the colors contribute to the mood of the painting? What major lines do you see? How do they function in the painting? Why might the artist have chosen to divide the painting into three parts? What do you see in each part? List all of the words that are included in this painting. What is the role of text in this painting? What other artistic elements help to tell the story? Have students read and discuss an informational text about Train Station: Share with students that this painting, made in 1935, is associated with the Great Migration, a period in American history when millions of African Americans moved from the rural south to northern cities. Explain that the artist, Walter Ellison, actually participated in the migration, moving from Macon, Georgia, to Chicago when he was a teenager. Point out that one of the figures in the painting carries a suitcase marked with the initials WWE, which were also the artist’s initials. Why were these details significant? What possible meanings was Ellison trying to convey through the painting? In what ways did these details help students gain a deeper understanding of the painting? What can Ellison’s painting help us understand about the experiences of migrants and immigrants? How did the video help you better understand the painting? What new insights did you gain? How does Ellison use symbolism? How is this painting a metaphor for the Great Migration? Then have students discuss the concept of using a train as a metaphor for freedom, as Dr. Kristen Buick describes in the video. Encourage them to think of other metaphors that are associated with historic efforts of African Americans to gain freedom in the United States. Why reasons might the groups of people in the painting have for going to their destinations? What makes you think that? What expectations might they have about their destinations? What do you see that makes you say that? Walter Ellison chose to represent the Great Migration with a scene of departure. Why do you think he did this? Why did he tell us about leaving the South rather than arriving in the North? Compare Kristen Buick’s interpretation of the painting (from the video) with the written interpretation. What did each one emphasize? How did each enhance your understanding of the painting? Lead a Think/Pair/Share activity: Have students think quietly for a minute or two about the following question: How does this painting help us better understand the experiences of individuals who came to Chicago during the Great Migration? Next, have them turn to a partner and discuss their answers to the question. Then invite students to share their responses with the whole class. Have students interview a family member, friend, or neighbor about a significant geographic move in that person’s life. Students should begin by developing interview questions that explore how and why the person left, what he/she was looking for, and what he/she found upon arriving. Students should use what they learn from the interview to develop a metaphor (like Ellison’s train) that symbolizes the person’s journey. Then have students create a tripartite collage (composed in three parts) that incorporates this metaphor and uses found images, drawings, and text to illustrate different aspects of the person’s journey. Students should think about how they can use line, color, shape, texture, and pattern to communicate a message about the expectations and realities that were part of the person’s journey. The Art Institute of Chicago. 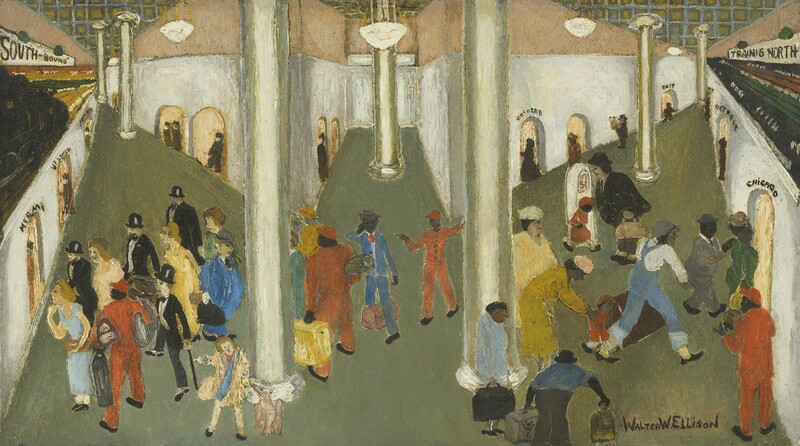 “Artwork Resource Packet: Train Station by Walter Ellison.” Accessed October 6, 2014. http://www.artic.edu/aic/resources/resource/1109?search_id=1&index=0. The Art Institute of Chicago. Teacher Manual: African American Art at the Art Institute of Chicago. Accessed October 6, 2014. http://www.artic.edu/aic/resources/resource/1151. Grossman, James R. Land of Hope: Chicago, Black Southerners, and the Great Migration. Chicago: The University of Chicago Press, 1989. A detailed account of African American migration to Chicago during World War I and its cultural impact. Lawrence, Jacob. The Great Migration: An American Story. New York: Harper Collins, 1995. This picture book presents the narrative of the Great Migration through the sixty paintings from Jacob Lawrence’s famed Migration series, painted in 1940 and 1941. Wilkerson, Isabel. The Warmth of Other Suns: The Epic Story of America’s Great Migration. New York: Random House, 2010. Winner of the National Book Critics Circle Award, this nonfiction book about the Great Migration examines the life journeys of three people who were part of it. Includes in-depth research and a critical analysis of this major event in U.S. history.